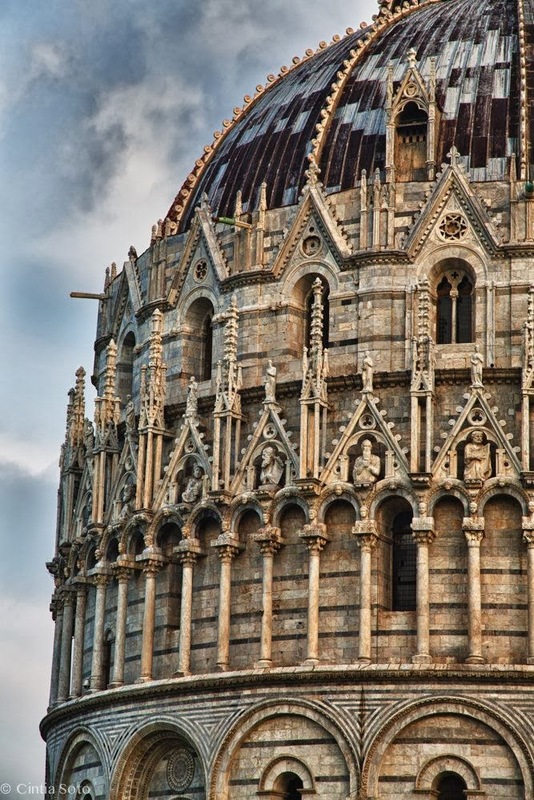 The Piazza dei Miracoli formally known as Piazza del Duomo is a wide walled area located in Pisa, Tuscany, Italy, recognized as an important center of European medieval art and one of the finest architectural complexes in the world. Considered a sacred area by the Catholic Church, the square is dominated by four great sacred edifices: the Pisa Cathedral, the Pisa Baptistry, the Leaning Tower of Pisa, and the Camposanto Monumentale (Monumental Cemetery). Partly paved and partly grassed, the Piazza dei Miracoli is also the site of the Ospedale Nuovo di Santo Spirito (New Hospital of the Holy Spirit), which houses the Sinopias Museum and the Cathedral Museum. The name Piazza dei Miracoli was created by the Italian writer and poet Gabriele d'Annunzio who, in his novel Forse che sì forse che no (1910), described the square as the "prato dei Miracoli" or the "meadow of miracles". The square is sometimes called the Campo dei Miracoli (Field of Miracles). In 1987 the whole square was declared a UNESCO World Heritage Site.